Proprioception is the body’s ability to transmit a sense of position, analyze that information and react (consciously or unconsciously) to the stimulation with the proper movement (Houglum 2001). Put simply, it is the ability to know where a body part is without having to look. Proprioception allows you to scratch your head without looking in the mirror or walk up a flight of stairs without having to peer at each stair. (Tarrant, 2003) Proprioception might be one of the major factors that separate the men from the boys - or more accurately the great from the pretty good athlete. Think about it: look at the body control, the awareness of where they are and others around them, and the sport specific moves that the great athletes of our time are known for. The ability to turn and see the basket; dive, catch, and come up throwing; the quarterbacks that not only have amazing "field vision" but also the near instantaneous body control to avoid the tackler. These proprioceptive abilities may be interrupted when there is an injury. Taken as a whole, proprioception includes balance, coordination and agility because the body’s proprioceptors control all these factors. Proprioceptors consist of both sensory and motor nerves that send and receive impulses to and from the central nervous system from stimuli within the skin, muscles, joints and tendons (Houglum 2001). These impulses transmit vital information, such as the amount of tension in a given muscle and the relative position of a body part during a given movement. 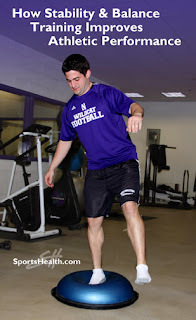 An example of proprioceptive exercises is the use of a balance board after an ankle sprain. The unpredictable movements of the balance board teach your body to react without having to think about these movements. 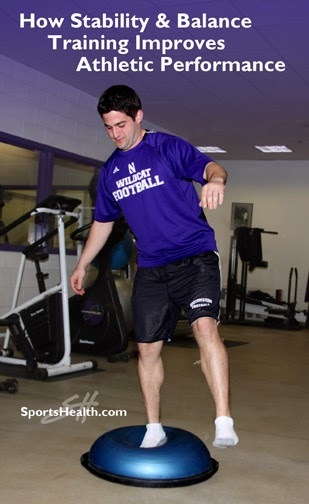 More equipment designed to improve proprioception is on the market today than ever before. There are boards on round blocks, air “cushions”, boards on air cushions and foam rubber of varying thickness and shapes. There are balance boards, wobble discs, stability trainers, BOSU® Balance Trainers, and Thera-Band® Stability Trainers just to name a few. The improvement or restoration of proprioception should be a normal part of every athlete’s conditioning and/or reconditioning protocol. For further clarification, go to How to Improve Proprioception by Michelle L. Tarrant, Med. For an excellent selection of proprioceptive supplies go to Sports Health at www.sportshealth.com.